Brain Chamber Research Team is Working to Cultivate and develop Black Pepper project in India on long term investment process. Our team works from ground level in business of spices. We do plantation of Black Pepper plant in our own and rented lands for production of black pepper. We develop fertile lands for cultivation black pepper for production of high quality black pepper spice. Our experts handles 1 acre to 100 acres of cultivated land for the production of export quality spices. Raw black peppers is brought in our processing unit to convert high quality black pepper to export. Black pepper is well known as king of spices. It belongs to the family of piperaceae found in tropical forests of western ghats in south India. It is cultivated in India, Brazil and Indonesia. Black pepper is important well known spices produced in India and exported in gulf countries. India has account 54% of cultivated area of black pepper in the world. It is climbing evergreen plant grows up to 10 m height or more. The leaves of plant broadly lanceolate, variations also comes in leaf shapes. Flowers of black pepper are very minute. Fruit is single seeded berry which is thin and soft. Here fully grown vines are completely covers the appearance of bush. It required six months to fully mature after flowering. Pepper starts yielding at 3rd or 4th years after plantations. It vines flower in May or June. Harvesting is done at from November to February. 2. Panniyur -2 : This varieties is suited in all areas of kerala but it is shade tolerant. Average yield : 2570 (Kg/ha). 3. Panniyur -3 : It is suitable for open area cultivation it perform well in open areas. It get late matured, Vigorously suitable to all areas of kerala. Average yield : 1953 (Kg/ha). 4. Panniyur -4 : It perform well in adverse condition including shade areas. Suited for all areas in kerala with stable yielder. Average yield : 1227(Kg/ha). 5. Panniyur -5 : This variety is suited for all pepper growing areas, it is shade tolerant and good for arecanut gardens. Average yield : 1098(Kg/ha). Black Pepper perennial climbing plant grows on supporting trees up to 4 meter heights. Fruits of black pepper are dried and unripe popularly known as 'Peppercorns'. Unripe green fruits is known as 'Green Pepper' made by freeze-drying. Black pepper are made by sun dried freshly harvested unripe green fruits. White pepper are made by removing skin from fruits. It is an excellent source of vitamin K and magnesium. Black pepper is a potent antioxidant which fights oxidative stress and keeps free from radicals at bay. It play protective role against stomach ulcer. It reduce aggressive factors which cause stomach ulcer. It helps to reliving pain and prevents inner lining of stomach against free radicals. It helps in digestion of food by enhancing secretion of saliva and enzymes present in saliva. Those enzymes helps n breakdown of food in minute molecules. It helps to reduce hypertension. 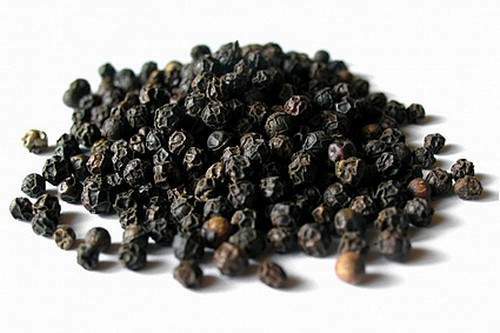 Piperine present in black pepper prevents calcium from entering into blood vessels. This ensure smooth blood flow through our body and makes relax. Brain Chamber Technologies is producer and exporter of black pepper spices from India. we are enthusiastic passionate about devising client centric solutions for food industries.